Definition at line 167 of file llscrolllistctrl.h. Definition at line 171 of file llscrolllistctrl.h. Definition at line 186 of file llscrolllistctrl.h. Definition at line 200 of file llscrolllistctrl.h. References FALSE, LLFontGL::HCENTER, LLFontGL::LEFT, llclamp(), mDynamicWidth, mFontAlignment, mHeader, mIndex, mLabel, mMaxContentWidth, mName, mParentCtrl, mRelWidth, mSortAscending, mSortingColumn, mWidth, NULL, S32, tut::sd(), and TRUE. Definition at line 253 of file llscrolllistctrl.h. Referenced by LLScrollListCtrl::addColumn(), LLColumnHeader::canResize(), LLColumnHeader::enableResizeBar(), LLScrollListColumn(), and LLColumnHeader::setHasResizableElement(). Definition at line 258 of file llscrolllistctrl.h. Referenced by LLScrollListCtrl::addElement(), and LLScrollListColumn(). Definition at line 257 of file llscrolllistctrl.h. Referenced by LLScrollListCtrl::addColumn(), LLScrollListCtrl::addElement(), LLNameListCtrl::addElement(), LLNameListCtrl::addNameItem(), LLColumnHeader::findSnapEdge(), LLScrollListColumn(), and LLScrollListCtrl::updateColumns(). Definition at line 255 of file llscrolllistctrl.h. Referenced by LLScrollListCtrl::addColumn(), LLScrollListCtrl::addElement(), LLColumnHeader::findSnapEdge(), LLScrollListColumn(), LLScrollListCtrl::onClickColumn(), LLColumnHeader::showList(), LLScrollListCtrl::updateColumns(), and LLColumnHeader::userSetShape(). Definition at line 250 of file llscrolllistctrl.h. Referenced by LLScrollListCtrl::addColumn(), LLColumnHeader::draw(), LLScrollListCtrl::getXML(), and LLScrollListColumn(). Definition at line 254 of file llscrolllistctrl.h. Referenced by LLColumnHeader::findSnapEdge(), LLColumnHeader::handleDoubleClick(), and LLScrollListColumn(). Definition at line 247 of file llscrolllistctrl.h. Referenced by LLScrollListCtrl::getSortColumnName(), LLScrollListCtrl::getXML(), LLScrollListColumn(), and LLScrollListCtrl::onClickColumn(). Definition at line 256 of file llscrolllistctrl.h. Referenced by LLScrollListCtrl::addColumn(), LLColumnHeader::draw(), LLColumnHeader::findSnapEdge(), LLScrollListColumn(), LLColumnHeader::onClick(), LLScrollListCtrl::onClickColumn(), LLColumnHeader::onSelectSort(), LLColumnHeader::setHasResizableElement(), LLColumnHeader::showList(), and LLColumnHeader::userSetShape(). Definition at line 252 of file llscrolllistctrl.h. 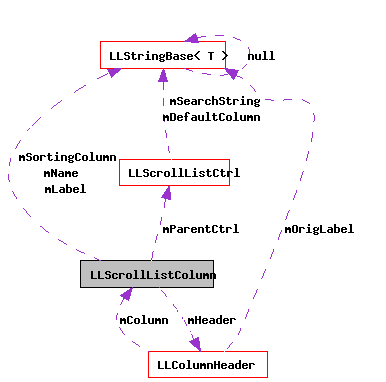 Referenced by LLScrollListCtrl::addColumn(), LLScrollListColumn(), and LLColumnHeader::userSetShape(). Definition at line 249 of file llscrolllistctrl.h. Referenced by LLScrollListColumn(), and LLScrollListCtrl::onClickColumn(). Definition at line 248 of file llscrolllistctrl.h. Referenced by LLColumnHeader::draw(), LLScrollListColumn(), LLScrollListCtrl::onClickColumn(), LLColumnHeader::onSelectSort(), and LLColumnHeader::showList(). Definition at line 251 of file llscrolllistctrl.h. Referenced by LLScrollListCtrl::addColumn(), LLScrollListCtrl::addElement(), LLScrollListCtrl::getXML(), LLScrollListColumn(), LLColumnHeader::showList(), LLScrollListCtrl::updateColumns(), and LLColumnHeader::userSetShape().